A recent study by the department of transportation of Portland, Ore., suggested that about 7 percent of the population would commute by bike in almost any weather conditions; the two groups making up that 7 percent were dubbed in the study "The Strong and the Fearless" and "The Enthused and the Confident." Far more numerous are the members of "The Interested But Concerned," a group defined by the fact that their concerns about bike safety outweigh their genuine interest in commuting on two wheels. This study [PDF link], already a landmark in municipal transportation circles, estimated that fully 60 percent of Portland's population fit into this category. Jason Van Driesche figures that the cultural similarities between Portland and Burlington mean that the local percentage of "Interested But Concerned" is roughly similar to that in Portland. The newly founded Burlington chapter of the international "Open Streets" movement is targeting that 60 percent. Van Driesche is director of advocacy and education for Local Motion, Burlington's nonprofit organization dedicated to promoting "people-powered transportation." He's excited about the first Open Streets event, which hits Burlington's Old North End on Sunday, September 21. With financial support from the City of Burlington and sponsorship from several local businesses, Local Motion is organizing the event, which will open up three miles of city streets to people-powered transit by closing them off to motor vehicles. Burlington's first Open Streets event isn't all about cycling. Walkers, skateboarders, rollerskaters, unicyclists and any and every other nonmotorized form of transportation is welcome. The free event, which runs from 9 a.m. to 2 p.m., will also feature a host of activities, from yoga classes to kids' arts and crafts to the blending of "bike-powered smoothies." The formal name for this no-cars-allowed event is ciclovía, a Spanish term meaning "bikeway." Borrowed from the decades-old weekly practice of closing streets to cars in Bogotá, Colombia, the term has come to refer to any Open Streets event. Ciclovías take place on a regular basis in such U.S. cities as Denver, Honolulu and Madison, and in many other locales all over the world. In Local Motion's case, the upcoming ciclovía/Open Streets event is not about the promotion of transportation alternatives per se, but, as Van Driesche prefers to call them, "transportation choices." 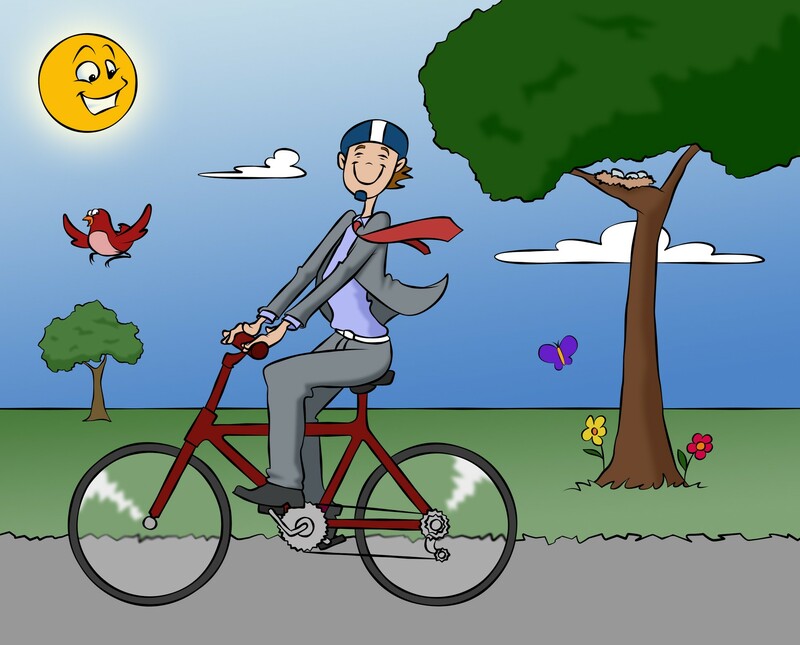 "Almost everybody who rides a bike has a car and needs to drive sometimes," he says. "And people who mostly drive, many of them would like to bike more, if it were safer. The whole point is to rethink our streets in ways that give people choices." 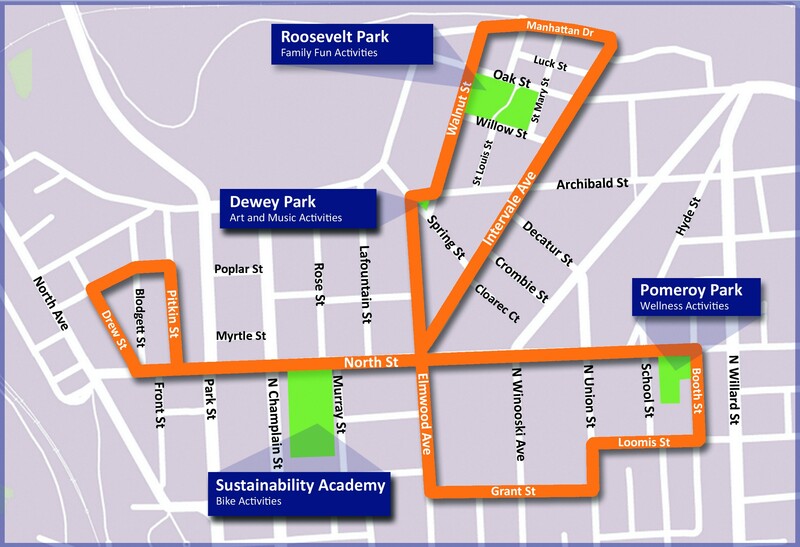 The epicenter of the inaugural Open Streets event will be the intersection of North Street and Elmwood Avenue in the Old North End, with car-free loops that also encompass Intervale Avenue, Grant Street and Walnut Street, among others. Bathrooms are set up along the route, and cyclists may lock up their rides in Roosevelt Park. Burlington's public parking garages will offer free parking all day. Van Driesche says that the city gave Local Motion a budget of about $12,000 for the event; the organization then raised an additional $10,000. Other sponsoring agencies include the Vermont Department of Health and the Burlington Walk-Bike Council. Both the Old and the New North Ends have seen their share of bike activism lately. On September 10, the local bike activism organization Bikeable Burlington Now! staged a "bike train," in which numerous cyclists, signs strapped to their bikes, pedaled up and down North Avenue. That street, a major north-south thoroughfare, has been the focal point of local transportation controversy, as well as the subject of a municipal transportation study. At issue is the avenue's intermittent bike lane and its difficulties in accommodating both motorized and nonmotorized vehicles. "What I hope this [event] will help people see is that streets can have a lot of different roles for a community," says Van Driesche. "Carrying cars is one of them, but there are a lot of other things that streets can do, as well. I hope this leads ... to a whole lot of innovation about interesting ways to use streets as public space as well as transportation corridors. They can play both roles with some creative planning and management." With specific regard to cycling on Burlington streets, Van Driesche says, "We need to be asking the questions, 'Would I be comfortable biking there with my 8-year-old kid? With my 75-year-old mom?' If the answer is no, we're not doing enough."